Disco Deviant are super excited to announce this one. Having worked to get this party off the ground for almost 5 years, the stars have now aligned, giving us great pleasure in welcoming Motor City Drum Ensemble to Disco Deviant. We've been fans since first hearing Raw Cuts #1 and have been both inspired and mesmerised by MCDE's releases and DJ sets over subsequent years. His DJ sets, often comprise of raw house and disco, flawless mixing, strong melodies and an ever building energy, taking the crowd up to an exciting and explosive climax, before switching direction with an inspired selection and perfect mix that takes things deeper. MCDE has a talent of bringing different styles together, taking elements of Hip Hop, Funk and Soul and working them into his productions. He was releasing authentic Deep House tracks long before the term was bandied around in its new and rather unflattering guise. His DJ style mirrors this approach, MCDE has a tremendous knack of selecting upfront releases and blending them with classics and rarities in a unique and absorbing fashion. His festival performances are celebrated far and wide, this summer alone he appeared at Dekmantel, Dimensions, Electric Elephant, Astropolis, Love Saves The Day, Southport Weekender, Dour & Buiten Westen + more, gaining thousands of new fans and supporters in the process. 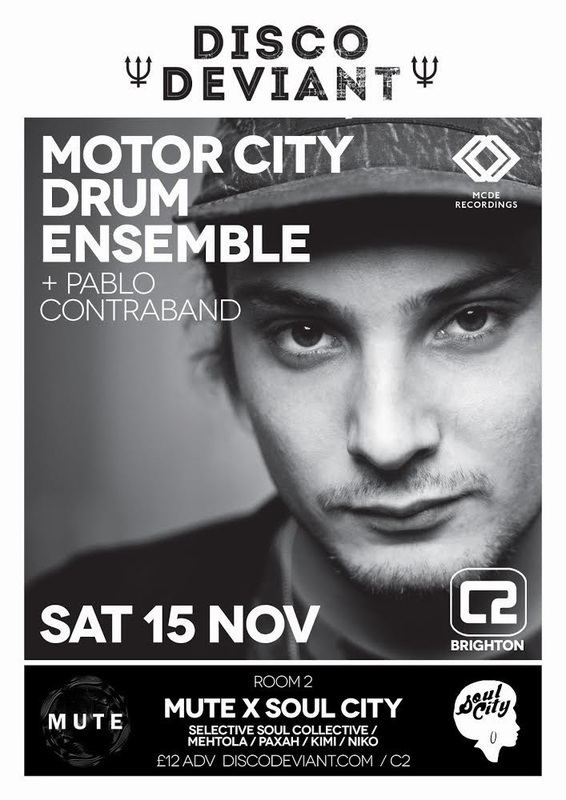 We are truly honoured to have MCDE make his Brighton debut with us at Disco Deviant on Saturday 15th November. Heading into room 2 we are pleased to have Mute x Soul City running the show in there. Disco, Funk, Soul meets UK Funky and bass. A nice contrast for the bar area. Limited release of tickets at £10 each are running very low so make sure you grab a bargain soon.